I love when my family has the opportunity to kick back in the evening and spend some time together. We often relax while watching a movie, sitting on the deck of our pool, having a bonfire, or just talking around the kitchen table. I always turn to this recipe for an evening treat because it is so quick and easy to assemble and everyone can join in to make their own favorite treat. I usually have the cookies made ahead of time. Then, I line up the counter with various tubs of ice cream flavors and an assortment of toppings. Everyone can load up their cookie sandwich with all of their favorites and enjoy family time together. In this busy world, I just love munching on this scrumptious treat and sharing quality time with those that I hold dearest in my heart. Toppings: Chocolate Chips, Sprinkles, Candies, etc. In a large bowl, mix together cake mix, eggs and oil. Use a small ice cream scoop to make 1″ balls with the dough and place on ungreased cookie sheets. Bake at 350 degrees for 6-10 minutes and light golden brown around the edges. After five minutes, remove to a wire rack to completely. 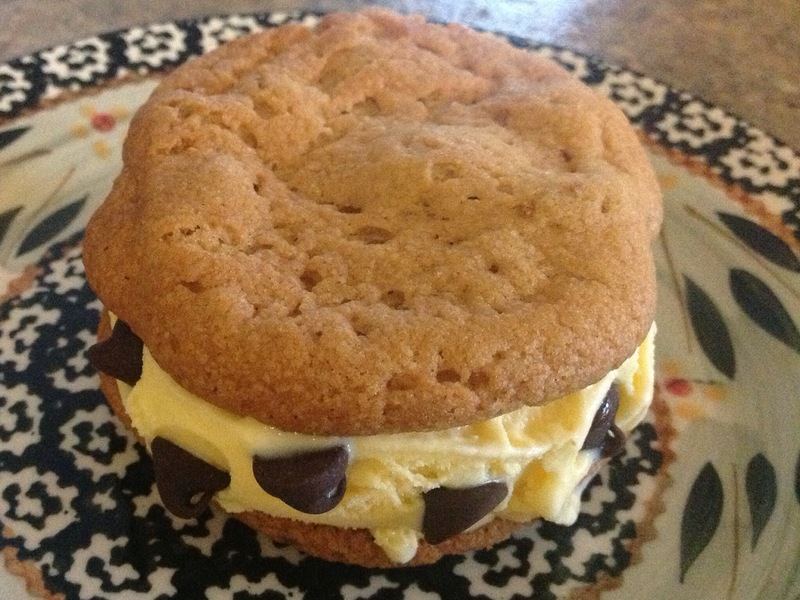 For filling, place a large scoop of ice cream between two cooled cookies, press firmly to flatten ice cream a bit. Press chocolate chips into the ice cream for added flavor. Note: Use any flavor cake mix, ice cream, or toppings, to make this a personalized family favorite.